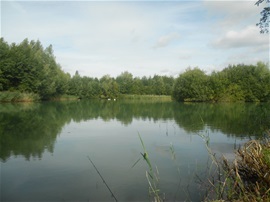 CUCKOO Pool has haunted me these past couple of years, ever since a valued friend, Nigel Evans, invited me to fish it with him. We were there at the kind invitation of the former Redmire bailiff, Rob Fox, whose pool it is. 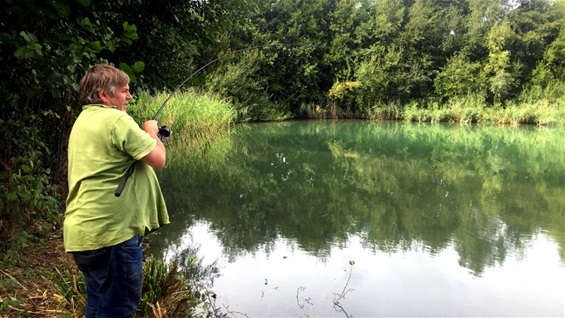 This pool, in a still hush-hush location "somewhere in the Three Counties" was stocked with small Leney carp from Redmire eight years ago, and they have been growing at quite a rate ever since. Cuckoo contained carp before then, and the pre-existing stock remains; and a mysterious stock it is too. Some of the "pre-Redmire" stock, which probably washed in due to floods, appear to have a touch - and only a touch, of the ghostie: but they are still magnificent fish all the same. There is also a huge dark fish, which I have not seen: but it is said to dwarf the largest of the commons from Redmire: the best of which are now approaching 25lbs in weight, or even more. 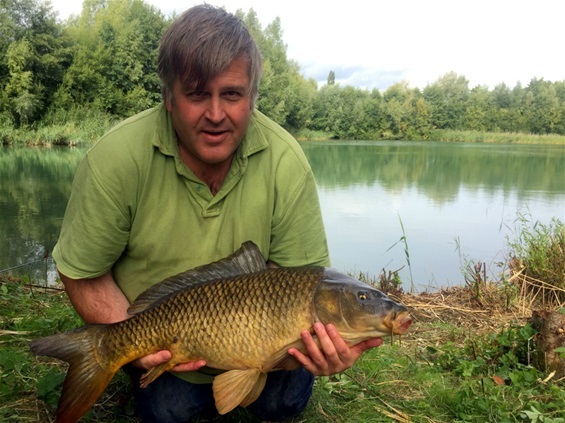 The first time Nigel and I fished Cuckoo, in July 2016, he caught a 19lb 8oz Leney common, after a dramatic night fight, and I caught a 19lb 12oz common, one of the original fish; a near 13lb Leney common and an 11lb Leney common: and so you can imagine our great excitement at the prospect of another Friday to Sunday session at this rather special pool. The pool is wild, and not easy; but this Friday it didn't take us too long to get among the fish. At first, I didn't fish in a very traditional way - opting to zig-rig a side-hooked krill floater close to the island. There were some large carp cruising around there, so when my baitrunner began to hiss out line I thought I was in for a right royal battle - but instead it was a 2.5lb Leney scamp. The Redmire stock are breeding well! 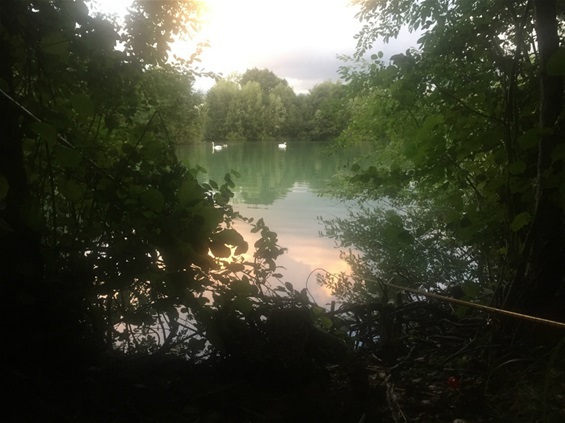 Nigel had opted to float fish a tight little swim in the trees and, hearing his shout, I found he was engaged in a major tussle with an 18lb 8oz common - a fish with perhaps a touch of ghostie - but still a beautiful, amazing and powerful carp. Nigel subdued it with a cane Barder MK IV rod, by the way, and I had the honour of netting it with an excellent replica of the Richard Walker net. 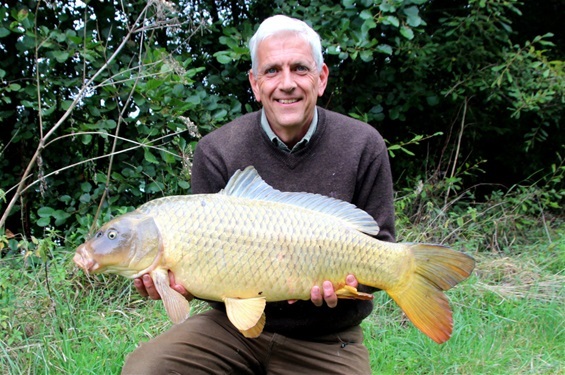 My big chance for a large fish came the following day, when a common carp (which I would say was in excess of 25lbs) took my floating crust in the bay. 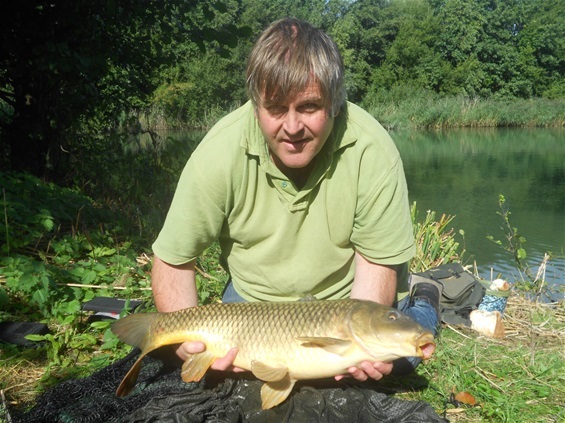 I missed on the strike - but made amends shortly afterwards with an 11lb Leney common and then - a 15lb 12oz Leney common. This fish put up a terrific struggle, sweeping immediately at speed to my right in a huge arc, despite or because of side strain, and making it into a little osier bed which was growing in the shallows. I thought it was all over; but pointing my rod directly at the snagged common and tugging on the line, just as Walker advised, did the trick nicely: with the fish swinging back into open water just as Nigel arrived, camera in hand, to see what all the commotion was about. The fight was slow and heavy then, and I was perhaps half anticipating a really big fish. Nigel did the honours with the net and we both agreed the fish would probably weigh in at around 18lbs; it looked about that order, but of course it weighed in a few pounds under that, not that I was complaining. I was fishing huge chucks of crust at range - perhaps as much as 40 yards at times. The idea was that, once a fish had committed itself to taking in such a large bait, rejection would be most unlikely! Even so, due to the clear water I could see the carp holding the bread between their lips, thinking about what to do next! I only struck once the white of the bread had vanished from sight, and only when the fish was turning away and the line was moving very noticeably across the surface. 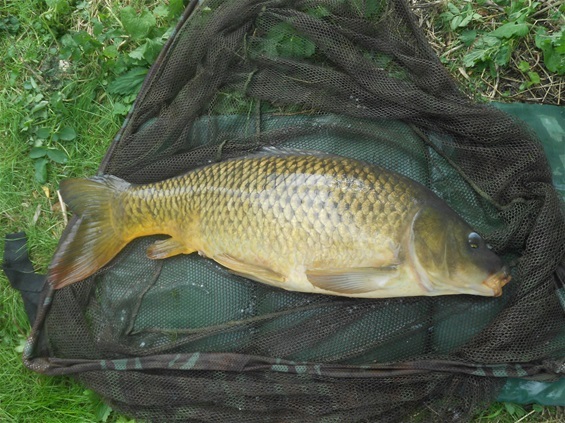 All this was happening with the huge Leney common I missed, which as I say, was probably in excess of 25lbs. Excitement, I think, made me strike just a little too soon; but who could blame me?! All in all, it was another most enjoyable session at Cuckoo Pool, and my thanks must go to Rob, for allowing us to fish again, and to Nigel, for inviting me along once more. My near sixteen pound Leney Common, - tail still wagging! It was fooled by long-range crust, in the bay. My near sixteen pound Leney, on the mat. 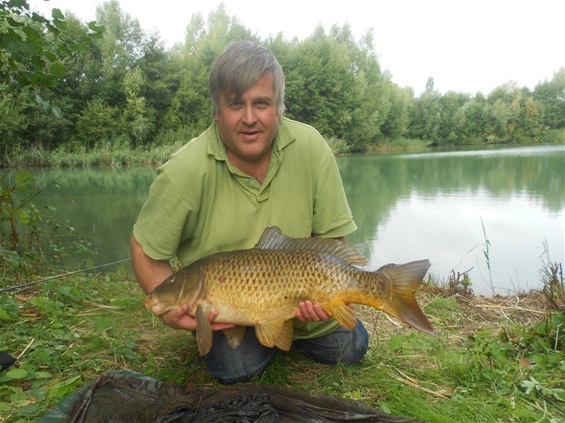 My eleven pound Leney Common. 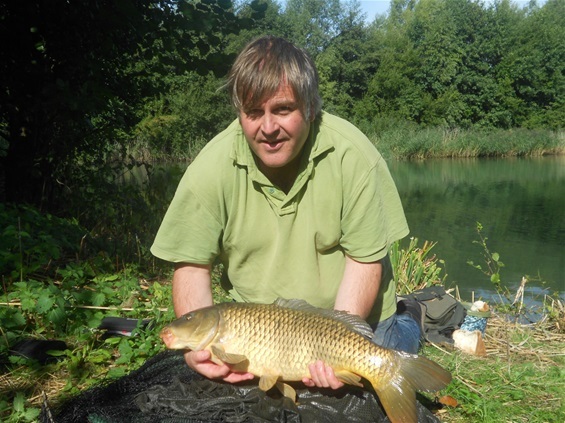 Nigel's marvellous 18lb 8oz common, battled with skill in a swim that was basically 'jungle warfare". Nigel's swim - even tighter in reality that it appears in this picture. 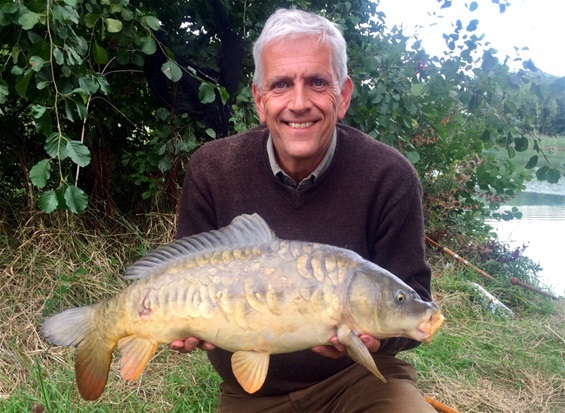 A stunning mirror - a tad under ten pounds.